Night and Moonlight was published in The Atlantic Monthly vol. 12, issue 72, in 1863. CHANCING to take a memorable walk by moonlight some years ago, I resolved to take more such walks, and make acquaintance with another side of Nature. I have done so. According to Pliny, there is a stone in Arabia called Selenites, "wherein is a white, which increases and decreases with the moon." My journal for the last year or two has been selenitic in this sense. Is not the midnight like Central Africa to most of us? Are we not tempted to explore it,—to penetrate to the shores of its Lake Tchad, and discover the source of its Nile, perchance the Mountains of the Moon? Who knows what fertility and beauty, moral and natural, are there to be found? In the Mountains of the Moon, in the Central Africa of the night, there is where all Niles have their hidden heads. The expeditions up the Nile as yet extend but to the Cataracts, or perchance to the mouth of the White Nile; but it is the Black Nile that concerns us. I shall be a benefactor, if I conquer some realms from the night,—if I report to the gazettes anything transpiring about us at that season worthy of their attention,—if I can show men that there is some beauty awake while they are asleep,—if I add to the domains of poetry. Night is certainly more novel and less profane than day. I soon discovered that I was acquainted only with its complexion; and as for the moon, I had seen her only as it were through a crevice in a shutter, occasionally. Why not walk a little way in her light? Suppose you attend to the suggestions which the moon makes for one month, commonly in vain, will it not be very different from anything in literature or religion? But why not study this Sanscrit? What if one moon has come and gone, with its world of poetry, its weird teachings, its oracular suggestions,—so divine a creature freighted with hints for me, and I have not used her,—one moon gone by unnoticed? I think it was Dr. Chalmers who said, criticizing Coleridge, that for his part he wanted ideas which he could see all round, and not such as he must look at away up in the heavens. Such a man, one would say, would never look at the moon, because she never turns her other side to us. The light which comes from ideas which have their orbit as distant from the earth, and which is no less cheering and enlightening to the benighted traveller than that of the moon and stars, is naturally reproached or nicknamed as moonshine by such. They are moonshine, are they? Well, then, do your night-travelling when there is no moon to light you; but I will be thankful for the light that reaches me from the star of least magnitude. Stars are lesser or greater only as they appear to us so. I will be thankful that I see so much as one side of a celestial idea, one side of the rainbow and the sunset sky. Men talk glibly enough about moonshine, as if they knew its qualities very well, and despised them,—as owls might talk of sunshine. None of your sunshine!—but this word commonly means merely something which they do not understand, which they are abed and asleep to, however much it may be worth their while to be up and awake to it. It must be allowed that the light of the moon, sufficient though it is for the pensive walker, and not disproportionate to the inner light we have, is very inferior in quality and intensity to that of the sun. But the moon is not to be judged alone by the quantity of light she sends to us, but also by her influence on the earth and its inhabitants. "The moon gravitates toward the earth, and the earth reciprocally toward the moon." The poet who walks by moonlight is conscious of a tide in his thought which is to be referred to lunar influence. I will endeavor to separate the tide in my thoughts from the current distractions of the day. I would warn my hearers that they must not try my thoughts by a daylight standard, but endeavor to realize that I speak out of the night. All depends on your point of view. In Drake's "Collection of Voyages," Wafer says of some Albinos among the Indians of Darien,—"They are quite white, but their whiteness is like that of a horse, quite different from the fair or pale European, as they have not the least tincture of a blush or sanguine complexion..... Their eyebrows are milk-white, as is likewise the hair of their heads, which is very fine..... They seldom go abroad in the daytime, the sun being disagreeable to them, and causing their eyes, which are weak and poring, to water, especially if it shines towards them; yet they see very well by moonlight, from which we call them moon-eyed." Neither in our thoughts in these moonlight walks, methinks, is there "the least tincture of a blush or sanguine complexion," but we are intellectually and morally Albinos,—children of Endymion,—such is the effect of conversing much with the moon. I complain of Arctic voyages that they do not enough remind us of the constant peculiar dreariness of the scenery, and the perpetual twilight of the Arctic night. So he whose theme is moonlight, though he may find it difficult, must, as it were, illustrate it with the light of the moon alone. Many men walk by day; few walk by night. It is a very different season. Take a July night, for instance. About ten o'clock,—when man is asleep, and day fairly forgotten,—the beauty of moonlight is seen over lonely pastures where cattle are silently feeding. On all sides novelties present themselves. Instead of the sun, there are the moon and stars; instead of the wood-thrush, there is the whippoorwill; instead of butterflies in the meadows, fire-flies, winged sparks of fire!—who would have believed it? What kind of cool, deliberate life dwells in those dewy abodes associated with a spark of fire? So man has fire in his eyes, or blood, or brain. Instead of singing-birds, the half-throttled note of a cuckoo flying over, the croaking of frogs, and the intenser dream of crickets,—but above all, the wonderful trump of the bull-frog, ringing from Maine to Georgia. The potato-vines stand upright, the corn grows apace, the bushes loom, the grain-fields are boundless. On our open river-terraces, once cultivated by the Indian, they appear to occupy the ground like an army,—their heads nodding in the breeze. Small trees and shrubs are seen in the midst, overwhelmed as by an inundation. The shadows of rocks and trees and shrubs and hills are more conspicuous than the objects themselves. The slightest irregularities in the ground are revealed by the shadows, and what the feet find comparatively smooth appears rough and diversified in consequence. For the same reason the whole landscape is more variegated and picturesque than by day. The smallest recesses in the rocks are dim and cavernous; the ferns in the wood appear of tropical size. The sweet-fern and indigo in overgrown wood-paths wet you with dew up to your middle. The leaves of the shrub-oak are shining as if a liquid were flowing over them. The pools seen through the trees are as full of light as the sky. "The light of the day takes refuge in their bosoms," as the Purana says of the ocean. All white objects are more remarkable than by day. A distant cliff looks like a phosphorescent space on a hill-side. The woods are heavy and dark. Nature slumbers. You see the moonlight reflected from particular stumps in the recesses of the forest, as if she selected what to shine on. These small fractions of her light remind one of the plant called moon-seed,—as if the moon were sowing it in such places. In the night the eyes are partly closed, or retire into the head. Other senses take the lead. The walker is guided as well by the sense of smell. Every plant and field and forest emits its odor now,—swamp-pink in the meadow, and tansy in the road; and there is the peculiar dry scent of corn which has begun to show its tassels. The senses both of hearing and smelling are more alert. We hear the tinkling of rills which we never detected before. From time to time, high up on the sides of hills, you pass through a stratum of warm air: a blast which has come up from the sultry plains of noon. It tells of the day, of sunny noontide hours and banks, of the laborer wiping his brow and the bee humming amid flowers. It is an air in which work has been done,—which men have breathed. It circulates about from wood-side to hill-side, like a dog that has lost its master, now that the sun is gone. The rocks retain all night the warmth of the sun which they have absorbed. And so does the sand: if you dig a few inches into it, you find a warm bed. You lie on your back on a rock in a pasture on the top of some bare hill at midnight, and speculate on the height of the starry canopy. The stars are the jewels of the night, and perchance surpass anything which day has to show. A companion with whom I was sailing, one very windy, but bright moonlight night, when the stars were few and faint, thought that a man could get along with them, though he was considerably reduced in his circumstances,—that they were a kind of bread and cheese that never failed. And that the glorious stars of heaven have none." And Sir Walter Raleigh well says, "The stars are instruments of far greater use than to give an obscure light, and for men to gaze on after sunset;" and he quotes Plotinus as affirming that they "are significant, but not efficient"; and also Augustine as saying, "Deus regit inferiora corpora per superiora": God rules the bodies below by those above. But best of all is this, which another writer has expressed: "Sapiens adjuvabit opus astrorum quemadmodum agricola terræ naturam": A wise man assisteth the work of the stars as the husbandman helpeth the nature of the soil. 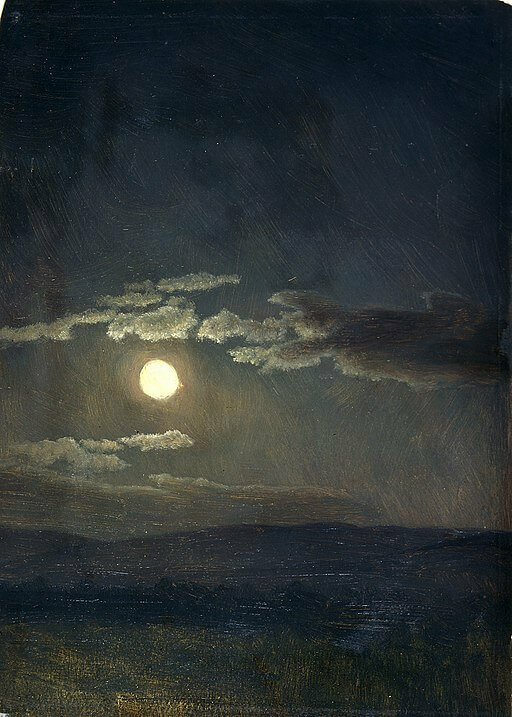 It does not concern men who are asleep in their beds, but it is very important to the traveller, whether the moon shines brightly or is obscured. It is not easy to realize the serene joy of all the earth, when she commences to shine unobstructedly, unless you have often been abroad alone in moonlight nights. She seems to be waging continual war with the clouds in your behalf. Yet we fancy the clouds to be her foes also. She comes on magnifying her dangers by her light, revealing, displaying them in all their hugeness and blackness,—then suddenly casts them behind into the light concealed, and goes her way triumphant through a small space of clear sky. In short, the moon traversing, or appearing to traverse, the small clouds which lie in her way, now obscured by them, now easily dissipating and shining through them, makes the drama of the moonlight night to all watchers and night-travellers. Sailors speak of it as the moon eating up the clouds. The traveller all alone, the moon all alone, except for his sympathy, overcoming with incessant victory whole squadrons of clouds above the forests and lakes and hills. When she is obscured, he so sympathizes with her that he could whip a dog for her relief, as Indians do. When she enters on a clear field of great extent in the heavens, and shines unobstructedly, he is glad. And when she has fought her way through all the squadron of her foes, and rides majestic in a clear sky unscathed, and there are no more any obstructions in her path, he cheerfully and confidently pursues his way, and rejoices in his heart, and the cricket also seems to express joy in its song. Richter says, that "the earth is every day overspread with the veil of night for the same reason as the cages of birds are darkened, namely, that we may the more readily apprehend the higher harmonies of thought in the hush and quiet of darkness. Thoughts which day turns into smoke and mist stand about us in the night as light and flames; even as the column which fluctuates above the crater of Vesuvius in the daytime appears a pillar of cloud, but by night a pillar of fire." Void of its flame, and sheds a softer day. Now up the pure cerulean rides sublime." Diana still hunts in the New-England sky. She Beauty is; by her the fair endure. By her is Virtue's perfect image cast." The Hindoos compare the moon to a saintly being who has reached the last stage of bodily existence. Great restorer of antiquity, great enchanter! In a mild night, when the harvest or hunter's moon shines unobstructedly, the houses in our village, whatever architect they may have had by day, acknowledge only a master. The village street is then as wild as the forest. New and old things are confounded. I know not whether I am sitting on the ruins of a wall, or on the material which is to compose a new one. Nature is an instructed and impartial teacher, spreading no crude opinions, and flattering none; she will be neither radical nor conservative. Consider the moonlight, so civil, yet so savage! The light is more proportionate to our knowledge than that of day. It is no more dusky in ordinary nights than our mind's habitual atmosphere, and the moonlight is as bright as our most illuminated moments are. Till morning breaks, and all 's confused again." Of what significance the light of day, if it is not the reflection of an inward dawn?—to what purpose is the veil of night withdrawn, if the morning reveals nothing to the soul? It is merely garish and glaring. "Where has darkness its dwelling? They descending on barren mountains?" who does not in his thought accompany the stars to their "cavernous home," "descending" with them "on barren mountains"? Nevertheless, even by night the sky is blue, and not black; for we see through the shadow of the earth into the distant atmosphere of day, where the sunbeams are revelling. You may also enjoy our collection of Nature Poems. Add Night and Moonlight to your own personal library.